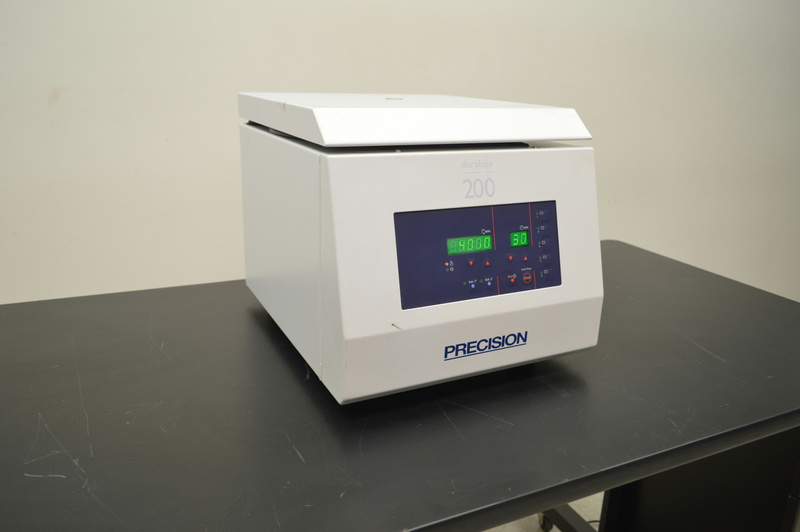 Precision Durafuge 200 Programmable Benchtop Laboratory 6000 RPMS . New Life Scientific, Inc. This Durafuge 200 is verified to be in good working condition by New Life Scientific technicians.Originally this unit included an internal fuse but it was found to be blown and difficult to replace. The internal fuse was removed and replaced with an exterior fuse for the sake of the users convenience. Our technicians also fabricated a new door latch opener. This centrifuge reaches 6000 RPMS and can run a max of 99 minutes or infinitely. The cosmetic condition is good, but shows some typical signs of wear and tear, such as scratches and other blemishes. The Durafuge 200 features 5 program memory, brushless induction motor, and several safety specifications in order to preserve user health and sample integrity. The manufacturer's manual can be found here. Good working and cosmetic condition.